Color charge is a property of quarks and gluons that is related to the particles' strong interactions in the theory of quantum chromodynamics (QCD). The "color charge" of quarks and gluons is completely unrelated to the everyday meaning of color. The term color and the labels red, green, and blue became popular simply because of the loose analogy to the primary colors. Richard Feynman referred to his colleagues as "idiot physicists" for choosing the confusing name. Particles have corresponding antiparticles. A particle with red, green, or blue charge has a corresponding antiparticle in which the color charge must be the anticolor of red, green, and blue, respectively, for the color charge to be conserved in particle-antiparticle creation and annihilation. Particle physicists call these antired, antigreen, and antiblue. All three colors mixed together, or any one of these colors and its complement (or negative), is "colorless" or "white" and has a net color charge of zero. Free particles have a color charge of zero: baryons are composed of three quarks, but the individual quarks can have red, green, or blue charges, or negatives; mesons are made from a quark and antiquark, the quark can be any color, and the antiquark will have the negative of that color. This color charge differs from electric charge in that electric charge has only one kind of value. However color charge is also similar to electric charge in that color charge also has a negative charge corresponding to each kind of value. Shortly after the existence of quarks was first proposed in 1964, Oscar W. Greenberg introduced the notion of color charge to explain how quarks could coexist inside some hadrons in otherwise identical quantum states without violating the Pauli exclusion principle. The theory of quantum chromodynamics has been under development since the 1970s and constitutes an important component of the Standard Model of particle physics. In quantum chromodynamics, a quark's color can take one of three values or charges: red, green, and blue. An antiquark can take one of three anticolors: called antired, antigreen, and antiblue (represented as cyan, magenta, and yellow, respectively). Gluons are mixtures of two colors, such as red and antigreen, which constitutes their color charge. QCD considers eight gluons of the possible nine color–anticolor combinations to be unique; see eight gluon colors for an explanation. An animation of the interaction inside a neutron. The gluons are represented as circles with the color charge in the center and the anti-color charge on the outside. Analogous to an electric field and electric charges, the strong force acting between color charges can be depicted using field lines. However, the color field lines do not arc outwards from one charge to another as much, because they are pulled together tightly by gluons (within 1 fm). This effect confines quarks within hadrons. 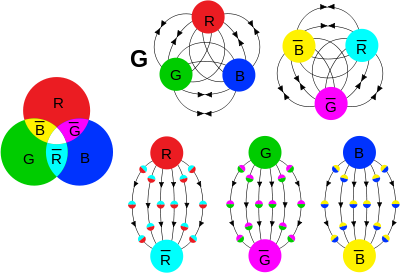 Fields due to color charges, as in quarks (G is the gluon field strength tensor). These are "colorless" combinations. Top: Color charge has "ternary neutral states" as well as binary neutrality (analogous to electric charge). Bottom: Quark/antiquark combinations. is the photon field, and ψ is the electron field with Q = −1 (a bar over ψ denotes its antiparticle — the positron). Since QCD is a non-abelian theory, the representations, and hence the color charges, are more complicated. They are dealt with in the next section. (there is an implied summation over a = 1, 2, ... 8). All other particles belong to the trivial representation (1) of color SU(3). The color charge of each of these fields is fully specified by the representations. Quarks have a color charge of red, green or blue and antiquarks have a color charge of antired, antigreen or antiblue. Gluons have a combination of two color charges (one of red, green or blue and one of antired, antigreen and antiblue) in a superposition of states which are given by the Gell-Mann matrices. All other particles have zero color charge. Mathematically speaking, the color charge of a particle is the value of a certain quadratic Casimir operator in the representation of the particle. The website arXiv turns up 40+ results for "Casimir scaling color", and two results for "color charge quadratic Casimir operator", one paper in particular "About the Casimir scaling hypothesis" explains: "A lattice calculation shows that the Casimir scaling hypothesis is well verified in QCD, that is to say that the potential between two opposite color charges in a color singlet is proportional to the value of the quadratic Casimir operator.". In the simple language introduced previously, the three indices "1", "2" and "3" in the quark triplet above are usually identified with the three colors. The colorful language misses the following point. A gauge transformation in color SU(3) can be written as ψ → U ψ, where U is a 3 × 3 matrix which belongs to the group SU(3). Thus, after gauge transformation, the new colors are linear combinations of the old colors. In short, the simplified language introduced before is not gauge invariant. Color charge is conserved, but the book-keeping involved in this is more complicated than just adding up the charges, as is done in quantum electrodynamics. One simple way of doing this is to look at the interaction vertex in QCD and replace it by a color-line representation. The meaning is the following. Let ψi represent the i-th component of a quark field (loosely called the i-th color). The color of a gluon is similarly given by A which corresponds to the particular Gell-Mann matrix it is associated with. This matrix has indices i and j. These are the color labels on the gluon. At the interaction vertex one has qi → gi j + qj. The color-line representation tracks these indices. Color charge conservation means that the ends of these color-lines must be either in the initial or final state, equivalently, that no lines break in the middle of a diagram. Since gluons carry color charge, two gluons can also interact. A typical interaction vertex (called the three gluon vertex) for gluons involves g + g → g. This is shown here, along with its color-line representation. The color-line diagrams can be restated in terms of conservation laws of color; however, as noted before, this is not a gauge invariant language. Note that in a typical non-abelian gauge theory the gauge boson carries the charge of the theory, and hence has interactions of this kind; for example, the W boson in the electroweak theory. In the electroweak theory, the W also carries electric charge, and hence interacts with a photon. Look up color charge in Wiktionary, the free dictionary. ^ Feynman, Richard (1985), QED: The Strange Theory of Light and Matter, Princeton University Press, p. 136, ISBN 978-0-691-08388-9, The idiot physicists, unable to come up with any wonderful Greek words anymore, call this type of polarization by the unfortunate name of 'color,' which has nothing to do with color in the normal sense. Georgi, Howard (1999), Lie algebras in particle physics, Perseus Books Group, ISBN 978-0-7382-0233-4 . Griffiths, David J. (1987), Introduction to Elementary Particles, New York: John Wiley & Sons, ISBN 978-0-471-60386-3 . Christman, J. Richard (2001), "Colour and Charm" (PDF), Project PHYSNET document MISN-0-283, archived from the original (PDF) on 2006-02-21 External link in |work= (help). Hawking, Stephen (1998), A Brief History of Time, Bantam Dell Publishing Group, ISBN 978-0-553-10953-5 . Close, Frank (2007), The New Cosmic Onion, Taylor & Francis, ISBN 978-1-58488-798-0 .